Sometimes people forget that websites are not something that just appears out of nowhere, nor are created automatically by some kind of robots…. There’s a lot of work that needs to be done every time and a number of people behind it that should take the credit for all this work. This is why humans.txt was created! The idea came from a Spanish group of web developers: Juanjo Bernabeu, Maria Macias, Carlos Mańas,Abel Cabans and Abel Sutilo. 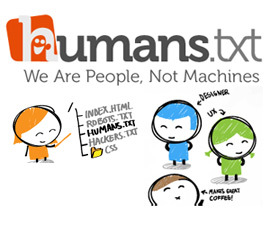 These are the same people who decided to create the humanstxt.org website, in order to further promote the whole idea, the motto of which is “We Are People, Not Machines”. Like robots.txt, humans.txt is a simple text file, placed in the root folder of a website, that provides information about the site and the people that created it. The main difference from the robots.txt is that, humans.txt is designed exclusively for humans in contrast with the former which is meant to be used only by search-bots. Freelancers that are temporarily hired by companies in order to create a website, often have great difficulties in establishing their authorship. There are times when companies don’t want the names of those people, for whatever reason, to appear in the same website that THEY created (and this is not ethically right, at the very least…). Even when you are the owner of a small company, consisting of 2 or 3 persons, why not to be able to present some information about each of those people separately? You could introduce the developer/s, the designer/s, SEO expert/s, or even those people that may had contributed with their ideas or played a particular role in the completion of a project (after all, they deserve to be thanked too!). Finally, you could consider this as a way to give a more personal or more “human” dimension to your websites (your own and those made for others). Even big companies, such as Google, have their own humans.txt file! It is a very easy process really. Just open your notepad and write about your website, the people that are behind it or give thanks to all those people that contributed. You can do this in whatever way you like (after all, this is only simple text we are talking about, not some kind of code) and upload it to the root folder of your site. Site: email, link to a contact form, etc. To learn more about humans.txt, visit http://humanstxt.org/.